HellermannTyton pre-printed solar labels are designed to ensure that photovoltaic installations meet NEC codes. 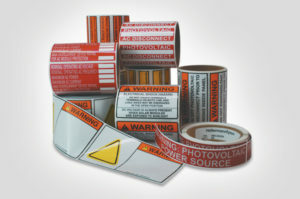 These pre-printed solar labels are made using high-performance UV stable materials and adhesives designed to stick to both baked enamel and powder coaedt surfaces. A thermal transfer printer can be used to pre-print labels where variable voltage or series data must be printed and displayed. Where applicable, labels are made using reflective materials for easy identification. Reflective labels can be read in poor light or darkness, and can be seen through smoke, which is critical for a first responder’s safety. Pre-printed solar labels come with the most common legends required by the authority having jurisdiction used on large utility and scaled projects to ensure code compliance during inspection.